In Color of Peach - Heart Chakra: Heals heartache pain layer by layer and replaces pain with joy. Color of White and Gray - Crown Chakra: Brings vision. Increases the awareness and understanding of the soul, knowledge of one's part in the universal plan, and awareness of spirit guides, soul mates and the Goddess. Color of Grays & Blacks - Base Chakra: Acts as a magnet for negative energy to pull it out and remove it, aids in walking one's talk and provides grounding. Botswana Agate has a Trigonal crystal system and is in the mineral class of oxides, the quartz group. Hot silicic acid solutions gather in hollow spaces formed by gas bubbles in cooling lava. As these solutions cool they solidify into quartz that is deposited in layers of these hollows. It's banding comes from the deposits of other substances in the layers. The different bands of Botswana Agate can contain several members of the Quartz family (Rock Crystal and Amethyst) with additions of the Chalcedony family (like Carnelian and Onyx), as well as many types of Jaspers. Botswana Agate is generally in shades of gray with sometimes peachy areas. It can show banding as well as solid areas of color as you can see in the photo above. This is a great grounding stone as well as one for enlightenment. It is very beneficial to use at the Base Chakra and at the Crown Chakra. Botswana Agate can be utilized to stimulate exploring the unknown and to further your quest towards an enlightened state. It will encourage a calm view of life which will lead to spiritual maturity and growth. 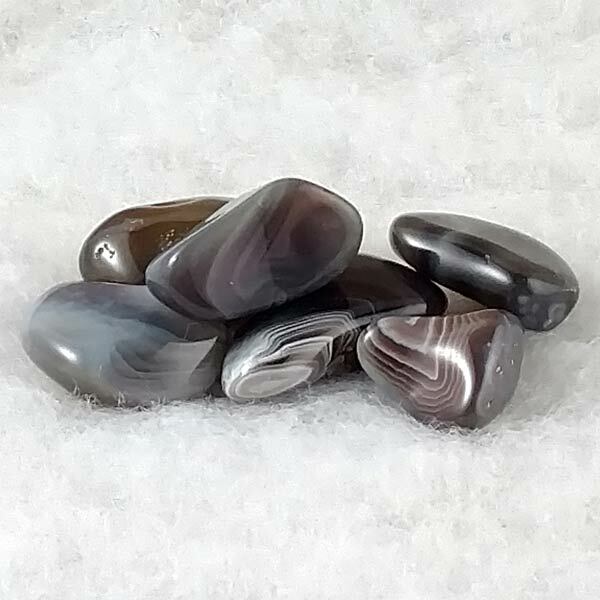 Botswana Agate provides protection, security and safety by dissolving internal tensions. It allows us to look towards a solution to emotional turmoil rather than dwelling on it. Botswana Agate provides the ability to attend to detail which can facilitate our sensitivity and recognition of understanding the whole picture regardless of the distortions we may have imposed. In this way we can utilize pragmatic solutions and put them into action without delay. It will also enhance concentration so we can take care of what is essential without distraction. 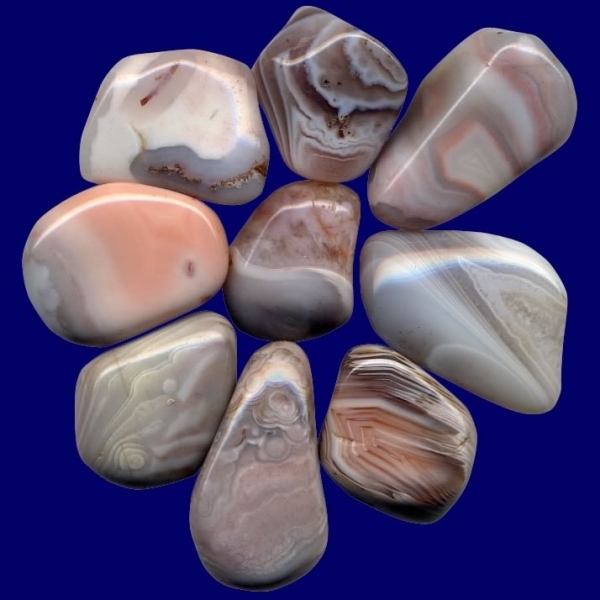 Botswana Agate has been used in the treatment of disorders of the nervous system. It has also been an aid in removing toxins from the body. It is reported to counteract poisoning on the physical, emotional and mental planes as well. Botswana Agate has an affinity with those under the sign of Gemini and Scorpio. It has a Projective Energy, its Element is Fire and its Planet is Mercury. It is recommended for Firefighters or those who regularly come in contact with excessive amounts of heat or smoke. In ancient Rome, Agates were worn in a ring or bound to the left arm to be granted the favor of plant deities who would cause the earth to be fruitful. They have also been used in protective spells and are believed to be a guard against sorcery, demons and possessions. In Botswana, its namesake, it is fashioned into bracelets for children and worn as protective amulets. It is believed that it prevents the children from falling and it is also worn by adults to prevent stumbling.